Here are the most important and most frequently used resources on this site. For more complete listings, please check the Resources or Workshops & Trainings pages! Media Law & Ethics Seminars are being held this quarter! They are required for all signers. Click below to access forms to checkout equipment! If your organization is looking to reserve computers and/or space in the Student Media Press Center, please follow this link and fill out the form. Leadership Trainings are presented to student organization leaders during Winter Quarter to build skills and knowledge on areas such as Group Dynamics, Effective Teamwork, and Conflict Resolution. 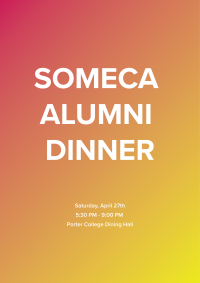 SOMeCA is celebrating 30 years of student organizing at this year's Dinner with Alumni. We invite you to join current and past student leaders for another outstanding program and dinner. Join us on Saturday, April 27th from 5:30 PM to 9:00 PM at the Porter College Dinning Hall. 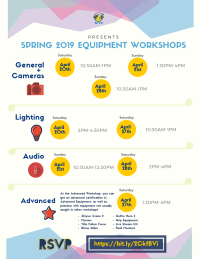 SCTV is hosting spring workshops where students can learn how to use cameras, lighting, audio, and more! Please submit all photos to bit.ly/shutterslug. You may submit either 3 photos or a photo series (3-5 images) with a short photo essay. The deadline is April 15th. All Student Media events can be found on the Blue calendar to the left. Have any questions? Let us know by sending an email to the front desk at studentmedia@ucsc.edu! Student Media allows organizations to reserve different parts of the Student Media building. If your organization is looking to reserve computers and/or space in the Student Media Press Center, please fill out the form below. Many students and organizations use the building space, so plan ahead and be mindful of what your organization will be using. Student Media at the University of California, Santa Cruz.